Ashwood Cottages is situated on more than a hectare of bushland and backs onto the Ovens River, Canyon walk and is a short distance to the Rail Trail. Our Cottages offer privacy due to large distance between them. 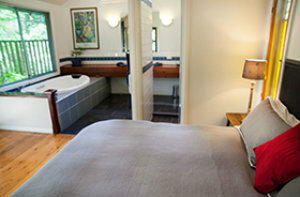 All Cottages feature King size beds, king size spas and log fires perfect for a romantic getaway! The Studio” is a unique style modern two storey cottage. The design is based on the old tobacco kilns. It features parquetry flooring downstairs, open plan modern lounge, dining and kitchen, tinted windows, decking area opening off the living area. This area has a setting for two with a BBQ overlooking the rural garden setting and backing onto the Ovens River. Fleurbaix Cottage”offers total relaxation with its fully glazed Conservatory/Atrium opening off the bedroom and lounge room through French Doors.Relax in the sun room while enjoying the peaceful garden setting. With only a short 2 minute walk to the Ovens River & Canyon walk. “The Haven” offers total privacy and seclusion. 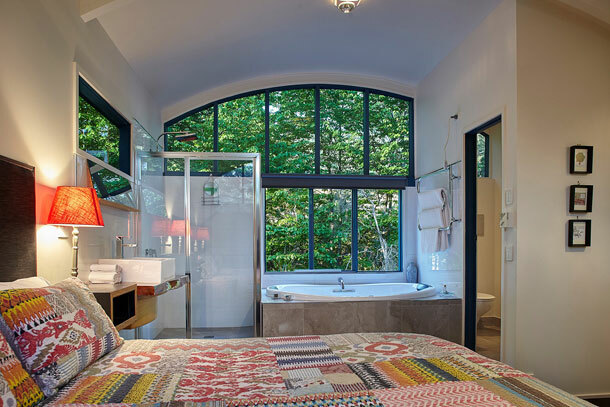 It features coloured leadlight windows, magnificent cypress flooring throughout . A large outdoor decking area,with a BBQ and outdoor setting for two.Surrounded by bushland and a short stroll to the Ovens River & Canyon walk.